JORJE REAL STATE PVT. 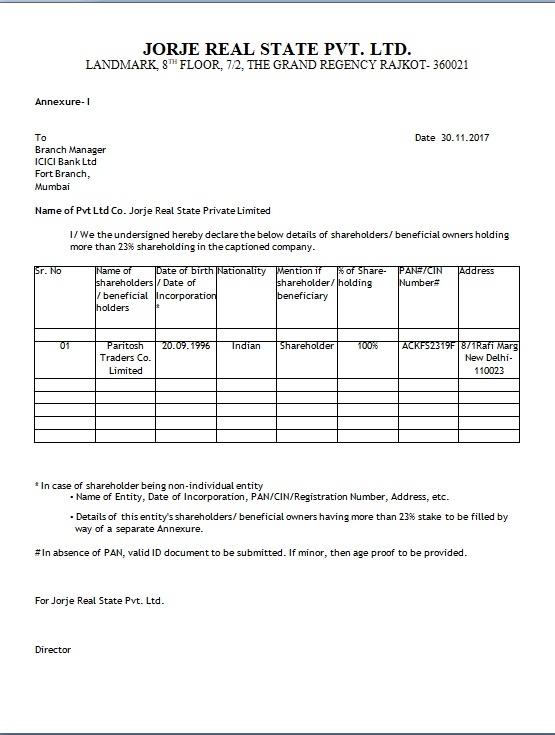 LTD.
I/ We the undersigned hereby declare the below details of shareholders/ beneficial owners holding more than 23% shareholding in the captioned company. • Name of Entity, Date of Incorporation, PAN/CIN/Registration Number, Address, etc. • Details of this entity's shareholders/ beneficial owners having more than 23% stake to be filled by way of a separate Annexure. # In absence of PAN, valid ID document to be submitted. If minor, then age proof to be provided. For Jorje Real State Pvt. Ltd.